So, on the 12th of November (in the US), something hit Marvel fans very hard. If you don't already know what it is I won't spoil it here, but if you have been on social media at all today you'd know what I'm talking about. I am looking for anybody to come collaborate with me on my YouTube channel to make a commemorative video. I am looking for somebody who feels passionate about the universe and is open to having a genuine discussion. 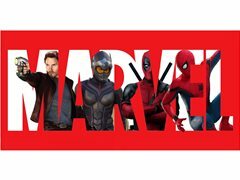 Marvel has meant a lot to me personally throughout my life and it's something I have a keen passion about and wish to share with the world. I would love to collaborate with you on something really special to commemorate this event. Please don't be afraid to ask as many questions as you want in your application. Not really a complex "role" to fill. No part you have to play because if you love Marvel, then it's naturally part of who you are! Only requirements of the role are to be a Marvel fan and be comfortable being in comfortable in front of a camera as it's a video for YouTube!